Activity at Arianespace is ongoing, and now for their next event they are preparing for four O3b Medium Earth Orbit (MEO) satellites for Arianespace’s first Soyuz mission of 2018, scheduled for a March 6 launch. The O3b satellites have been integrated with their launcher’s Fregat upper stage, thus completeing a key milestone. These spacecraft that previously were clustered on their dispenser system, were mated atop Soyuz’ Fregat upper stage during operations in the Spaceport’s S3B payload preparation facility. This activity will be followed by encapsulation of the Fregat stage and its satellites in a protective payload fairing, creating an “upper composite” unit to be placed atop Soyuz once the vehicle has been rolled out to the launch zone. Busy hands as four O3b MEO satellites are integrated for their upcoming Arianespace Soyuz launch The four O3b Medium Earth Orbit (MEO) satellites for Arianespace’s first Soyuz mission of 2018 have been integrated with their launcher’s Fregat upper stage, marking a key milestone as preparations continue for a March 6 liftoff from French Guiana. 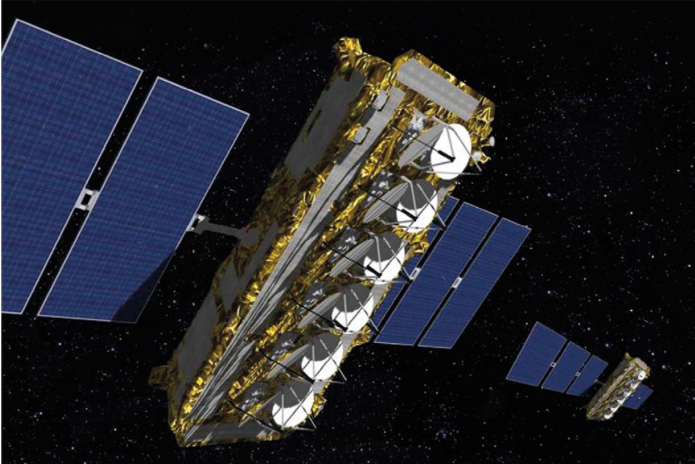 After their launch by Arianespace, the O3b satellites will be operated by SES Networks to provide the world with low latency, fiber-like connectivity in the growing mobility, fixed data and government markets. The trapezoidal-shaped Ka-band relay platforms, produced by Thales Alenia Space, have a liftoff mass of 700 kg. each. Twelve O3b satellites currently are in orbit, launched by Arianespace using its medium-lift Soyuz workhorse to carry four spacecraft each on launches that date back to June 2013, followed by missions in July and December 2014. Soyuz’ March 6 launch, designated Flight VS18 in Arianespace’s launcher family numbering system, will be the 18th with Soyuz from the Spaceport since this vehicle was introduced at the French Guiana base in 2011 where it joined the company’s heavy-lift Ariane 5 and lightweight Vega. For Arianespace’s second launch of 2018, the company will use a Soyuz launch vehicle to orbit four additional O3b MEO (Medium Earth Orbit) satellites in the constellation operated by SES Networks. This 18th Soyuz launch from the Guiana Space Center (CSG) in French Guiana is the fourth performed for the O3b MEO fleet, following the deployment in 2013 and 2014 of the constellation’s first 12 satellites. With the launch of these four latest satellites, Arianespace is supporting SES Networks in the expansion and evolution of its constellation, which has been in commercial service since September 2014. Positioned at approximately 8,000 km., the O3b satellites are about four-times-closer to Earth than geostationary (GEO) satellites, and provide low-latency, fiber-like connectivity. The new Ka-band satellites will join the existing O3b constellation to deliver high-speed connectivity to people and businesses in the growing mobility, fixed data and government markets. By scaling efficiently its MEO fleet, SES is adding 38 percent more capacity across the globe and growing the addressable market from 45 to 50 degrees north and south latitude. The O3b satellites lofted by Arianespace Flight VS18 are the 54th, 55th, 56th and 57th satellites to be launched by Arianespace for the global satellite operator SES. The O3b satellites lofted by Arianespace Flight VS18 are the 54th, 55th, 56th and 57th satellites to be launched by Arianespace for the global satellite operator SES. SES will be launching another four O3b MEO satellites for the constellation with Arianespace in 2019. In addition, Arianespace also has one SES geostationary satellite in its order book. 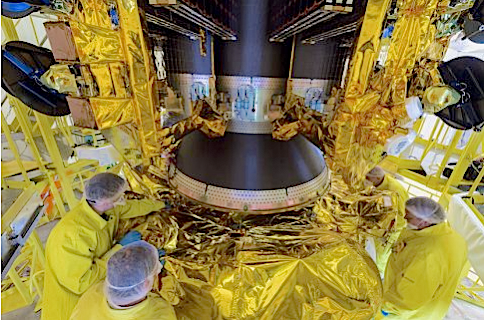 The O3b satellites on Flight VS18 were built by Thales Alenia Space in its plant in Cannes, France. They are the 151st to 154th satellites from this manufacturer to be launched by Arianespace. SES states they are the world-leading satellite operator and the first to deliver a differentiated and scalable GEO-MEO offering worldwide, with more than 50 satellites in Geostationary Earth Orbit (GEO) and 12 in Medium Earth Orbit (MEO). SES focuses on value-added, end-to-end solutions in two key business units: SES Video and SES Networks, and provides satellite communications services to broadcasters, content and internet service providers, mobile and fixed network operators, governments and institutions. SES’s portfolio includes the ASTRA satellite system, which has the largest Direct-to-Home (DTH) television reach in Europe; O3b, a global managed data communications service provider; and MX1, a leading media service provider that offers a full suite of innovative digital video and media services. The four O3b MEO satellites orbited on VS18 will enable SES Networks to offer more capacity, enhanced coverage, increased efficiencies and greater reliability while delivering carrier-grade services including MEF Carrier Ethernet 2.0 certified services to telecommunications operators, mobile network operators (MNOs), enterprises, Internet service providers (ISPs) and government customers. Eleven other Thales Alenia Space-built satellites are in Arianespace’s order book.